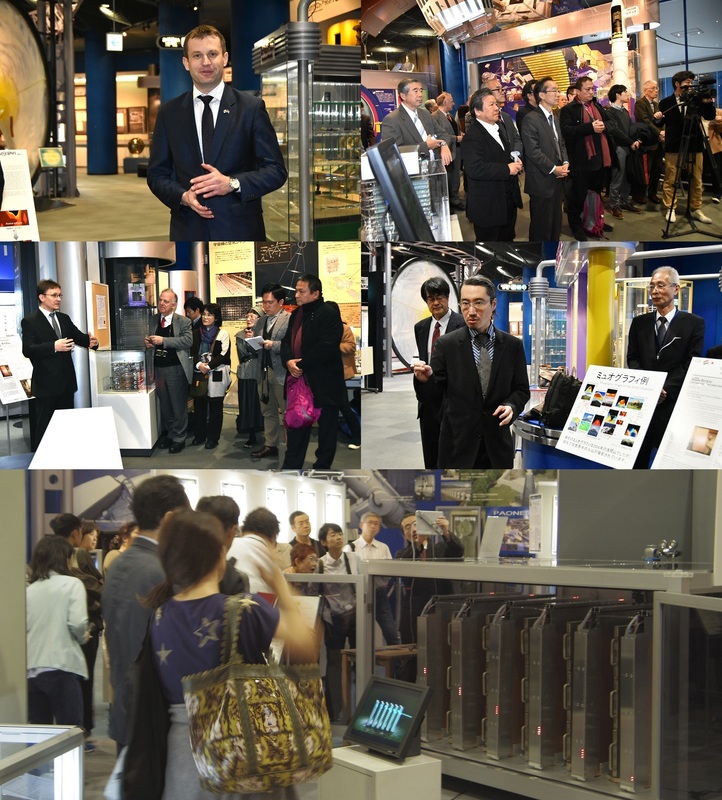 Reflecting a spirit of international and cross disciplinary cooperation, the press conference for the opening of the scientific “Nobel Prize Exhibit” at the Osaka Science Museum (located in Osaka, Japan) was attended by members of the Hungarian scientific and diplomatic community, together with Japanese scientists, engineers, artists, and designers. Following the signing of an academic agreement between the University of Tokyo and the Wigner Research Centre for Physics of the Hungarian Academy of Science on Intellectual Property Cooperation, the expertise of Hungarian and Japanese scientists could join forces to build a more efficient, higher-resolution and cost effective 3rd generation muography detector. Hungarian Ambassador, H. E. Dr. Norbert Palanovics, gave a speech at the press conference about this collaboration which began in 2016. Dezso Varga (Group Leader, Wigner Research Centre for Physics of the Hungarian Academy of Sciences, Hungary) and Hiroyuki Tanaka (Professor, University of Tokyo) discussed the scientific developments leading up to this achievement. However, It wasn’t enough to have a beautifully designed detector. It wasn’t enough to display a working experiment in this museum. These things had been done before in the previous exhibit at Osaka Science Museum in 2016. In an effort to further inspire and educate the general public attending the exhibit, the Earthquake Research Institute (University of Tokyo) teamed up with designer Toshiyuki Kita (awarded the Italian Commendatore in 2017) and software designers from the Hirose Tanikawa Narumi Lab (University of Tokyo) to revamp the industrial design of the detector to better reflect its operation and create a new muography augmented reality experience. The way muography works is similar in principle to photography. What would we see if our eyes used muon particles instead of photon particles to construct images of the environment surrounding us? To experience this visually, an augmented reality software application that functions on most smartphones and tablets connects with the newly developed 3rd generation Japanese/Hungarian muography detector installed at museum. Visitors at the Osaka Science Museum can use this application either on their own compatible devise or on the iPad that the museum provides. The user stands facing the side of the detector shorter side of the detector and holds the device in front of them. By directing the visitors to this particular position, it is easier for them to notice how the placement of the detector determines the angle of the resulting muography image. This was demonstrated by Hiroyuki Tanaka at a lecture following the press conference. Once the application is launched, the screen will display what it would be like if one’s eye corresponded to what the detector would process. Only gigantic images are visible to muons. The walls and other smaller obstructions in the museum are invisible and only a large city building near the museum is seen. 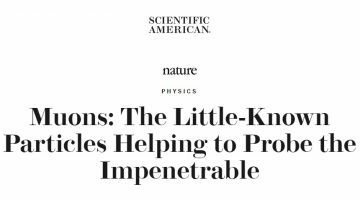 Moreover, unlike photons that bounce off the surface of objects, muons tend to penetrate through objects. Generally, the higher the energy of the muon, the more strongly penetrative it is. Therefore, the density of the inner structure of the building is also visible. In this way, the software gives users the opportunity to intuitively understand the nature of muon particles, their detection and the resulting muography image. Real-time data generated from the muography detector is converted into an image automatically by the software for display. In order to immerse the user more fully in the experience, the muography image is displayed on the devise using augmented reality which tracks the movements of the device to coordinate with the image display to give users the experience of interactively viewing the simulation. Another creative use of virtual reality in museums was recently done by the Kansai University Project to Understand Muography group, another of the Muographer collaborators, at the Lab exhibit space in Grand Front, Osaka.